Cellular physiological responses, which are often obscured by inferences from population-level data, are of great importance in cell biology. Microfluidics has emerged as an important tool for biological research on a small scale, reaching even the single-cell level. In this work, a flow-focusing microdroplet generator was developed to produce monodisperse microdroplets with high stability. Individual B. coagulans cells were encapsulated in the microdroplets and cultured offline. The specific growth rate of B. coagulans at the single-cell level was analyzed, and the growth of B. coagulans in the droplets showed good consistency with that in flasks, with a correlation coefficient of 0.98. The morphological heterogeneity and its potential relationship with the production of lactic acid by B. coagulans were evaluated using a microscopic imaging method. We have demonstrated a single-cell monitoring methodology based on microdroplets. This approach has great potential for studying a range of behavioral and physiological features of bacteria at the single-cell level. As a lactic acid-forming bacterial species, B. coagulans has been widely used in the industrial production of lactic acid. Estimated to have reached 367,300 metric tons by 2017, the demand for lactic acid is expected to grow at a yearly rate of almost 20% due to the increasing demand for polylactic acid (Abdel-Rahman et al. 2013). As a result, significant efforts have focused on maximizing the production of lactic acid by B. coagulans by optimizing growth conditions and developing bioreactors. The field of microbiology has traditionally been concerned with and focused on studies at the population level. Recently, researchers have pursued methods for observing cellular physiological responses, which are often obscured by inferences from population-level data. Microfluidic platforms have emerged as important tools for biological research at a small scale, even down to the single-cell level. Furthermore, due to the low material consumption and monodisperse size of microdroplets, microdroplet technology is a promising tool for B. coagulans strain screening (Abalde-Cela et al. 2015; Kim et al. 2015; Lim and Abate 2013). 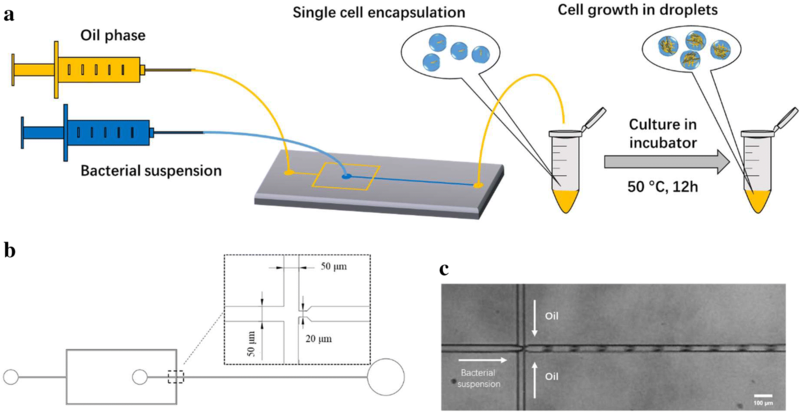 Various microfluidic devices have been introduced for the study of cell cultivation and high-throughput screening (Shen et al. 2014); (Falconnet et al. 2011). Diverse methods of droplet generation and droplet capture have been developed to monitor cell growth (Jakiela et al. 2013; Yu et al. 2014). In this study, a low-cost oil and surfactant combination that was stable under high temperature (50 °C) was developed. For nonspheroid cells, the effective pixel approach provided a simple method for cell counting. In addition, we studied the consistency of cell growth in droplets and in shaking flasks as well as the relationship between phenotype and lactic acid production. Furthermore, the growth of B. coagulans from single cells was observed by microscopic imaging. We quantitatively analyzed the growth of B. coagulans and found that the growth of B. coagulans within the droplets was consistent with that in flasks. The morphological heterogeneity of B. coagulans and its relationship with lactic acid production were studied and it was found that longer B. coagulans cells have a lower productivity of lactic acid. Bacillus coagulans HL7-A, a derivative of the industrial strain B. coagulans (CGMCC NO. 1.2407) obtained by random mutagenesis, was used in this study. The liquid medium contained 90 g of glucose l−1, 13.33 g of yeast extract l−1, 13.33 g of tryptone l−1, 0.67 g of CH3COONa l−1, 0.01 g of NaCl l−1, 0.01 g of MgSO4 l−1, 0.01 g of FeSO4 l−1, and 0.01 g of MnSO4 l−1. The pH was adjusted to 6.0 with HCl and NaOH, and the medium was sterilized for 20 min at 115 °C. The glucose was separately sterilized at 115 °C and mixed with the medium before inoculation. After generation, microdroplets were collected in a 2-ml EP tube and cultured at 50 °C for 12 h in an incubator without shaking. In flasks, cells were incubated at 50 °C with shaking (200 rpm) for 12 h with a seeding density of approximately 9 × 107 cells ml−1. The pH was not controlled for either culture mode. The pattern for the microfluidic device was designed using AutoCAD and was produced on a high-resolution plotted film. This film was bonded to a customized quartz glass, resulting in a compositional photomask. The negative photoresist SU-8 2075 was spin-coated onto a 4-inch silicon wafer. A mask aligner was subsequently used for photoetching and led to a male mould in the silicon wafer. PDMS (polydimethylsiloxane) pre-polymer and curing agent were mixed at a ratio of 10:1 and rapidly stirred. The PDMS mixture was poured onto the silicon master, degassed in a vacuum oven, and then cured at 65 °C overnight. After curing, the PDMS replica containing the microchannel pattern was peeled away from the silicon master. A hole puncher was used to create holes in a set position to form inlets and outlets for the samples and reagents. The PDMS replica and glass slides were exposed to an oxygen plasma (Harrick Plasma, USA) for 180 s at 300 W and were then face–face bonded. For W/O (water in oil) microdroplet formation, paraffin oil (Sigma-Aldrich) containing 3.0% (w/w) ABIL EM90 surfactant was used as the oil phase. A cell suspension at a concentration of ~ 3.5 × 106 cells ml−1 was used as the aqueous phase. These two fluids were loaded into 1-ml gas-tight syringes (BD, USA). Two syringe pumps (Chemyx, USA) were used to deliver each phase into the flow-focusing microfluidic device through polyethylene (PE) tubing (ID = 0.5 mm). The flow rates of Foil and Faqu were 200 and 40 μl h−1, respectively. The EVOS FL Auto Imaging System (Thermo, USA) was used for microscopic imaging of the droplets. For bright-field microscopic images, droplets were distributed on a glass slide or in the wells of 96-well plates and observed under 400× magnification. During image acquisition, microscope focusing was first applied to ensure maximum hyphal presentation and then to maintain clarity. Under these criteria, cells of different depths of field can be presented on 2D images. In the worst case, a hypha was exactly perpendicular to the observation plane such that only one point was observed. This situation was easy to avoid because the hyphae show Brownian motion and frequently change direction. Thus, images were not captured until the hyphae reached a maximum imaging length. For pixel statistics, three photos of the same droplet were taken to obtain a mean value. For fluorescence microscopic images, the pH-sensitive Invitrogen pHrodo Green (Thermo, USA) dye was used to indicate lactic acid production. The optimal absorption and fluorescence emission maxima of the pHrodo Green dye and its conjugates are approximately 509 nm and 533 nm, respectively. To minimize the impact of background fluorescence of the medium, the DAPI channel was chosen for imaging. In this study, wells of 96-well plates were used as vessels for the observation of droplets. Each well was pre-filled with 90 μl of the same oil phase used in droplet generation. After droplet generation, a 10-μl emulsion of droplets collected in the EP tube was transferred to the wells by a pipette. Then, the emulsion was gently mixed using the pipette tip. This procedure was performed 3 more times to achieve a gradient dilution of the droplets. Tens of droplets were present in each well, and these droplets were distributed in a single layer, which was conducive to observation. The 96-well plate was gently moved from the incubator to the microscope stage when observation was needed. Due to the high viscosity of the oil phase, the droplets maintained their position during this process. The hyphal length in a droplet containing a mass of cells was calculated from the average value of five randomly selected hyphae in a given droplet. The standard deviations were also calculated and are shown as error bars. According to the length of the hyphae, the droplets were divided into three groups: < 5 μm, 5–10 μm and > 10 μm. For fluorescence measurements, all droplets were photographed using the same microscope parameters. Then, the fluorescence images were converted into gray-scale images, and the gray values were counted. The average gray values of all the droplets in each group were calculated and compared. The standard deviations were also calculated and are shown as error bars. In this section, the microdroplet was used as an individual vessel to investigate the growth of B. coagulans at the single-cell level. A flow-focusing microfluidic device was used to generate microdroplets with a low polydispersity (Fig. 1). As the incubation temperature of B. coagulans reached 50 °C, obtaining droplets with long-term stability was challenging. By extensively screening diverse oils and surfactants, we found that paraffin oil (Sigma, USA) containing 3.0% (w/w) ABIL EM90 surfactant could produce droplets with long-term stability. For cell culture in flasks, the seeding density of B. coagulans was ~ 9 × 107 cells ml−1. To maintain a constant seeding density, the diameter of a droplet containing one cell should be 27.4 μm based on theoretical calculations. The size of the droplets could be controlled by the diameter of the generating nozzle, as well as the flow rate ratio of the different phases. Here, using flow rates of 200 μl h−1 (Foil) and 40 μl h−1 (Faqu) and a generating nozzle with dimensions of 20 μm × 25 μm (width × depth), monodisperse droplets of ~ 28 μm in diameter (~ 12 pl in volume) (Fig. 2a) were formed. The microdroplets were stable and did not fuse with each other whilst being transferred into the EP tube and cultured at 50 °C for 12 h (Fig. 2b). The number of cells in each droplet follows a Poisson distribution (Hosokawa et al. 2015), which was dependent on the incoming cell density. Herein, a bacterial suspension at the exponential growth phase (6 h of growth in a flask) was diluted with fresh medium to a concentration of ~ 3.5 × 106 cells ml−1. The suspension was then introduced into the microdroplet device to generate a suspension of droplets in oil. Under these conditions, approximately 22% of the microdroplets contained only one cell (Fig. 2c, d). The growth of B. coagulans cells encapsulated in microdroplets was monitored by microscopic imaging at different incubation times. Five droplet images were randomly selected at different time points and are presented together artificially for better comparison, as shown in Fig. 3. 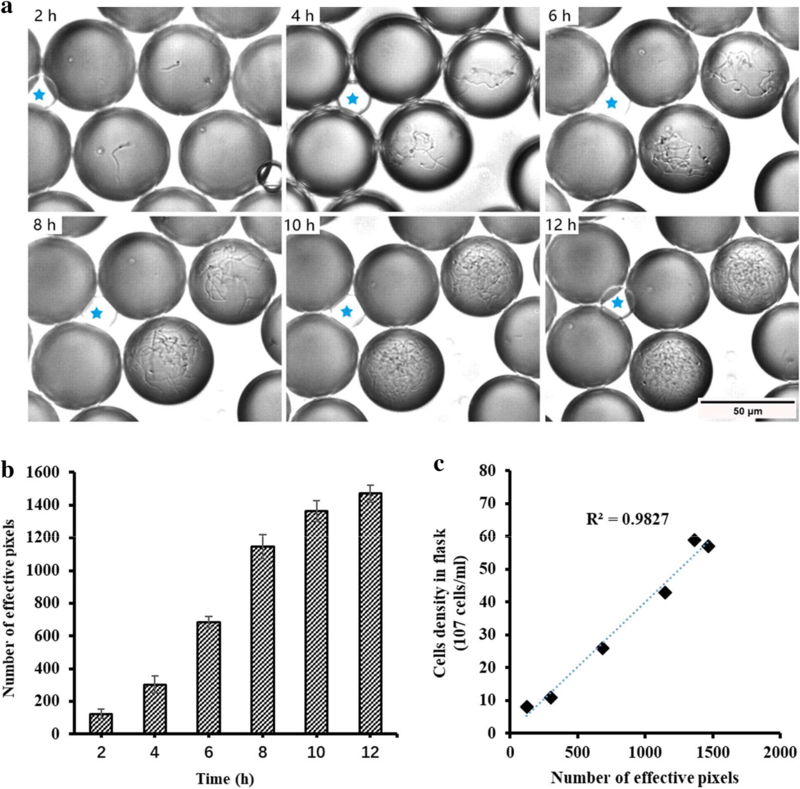 These images clearly show the growth of B. coagulans in the microdroplets over 12 h after encapsulation. During the first 2 h, the bacteria grew in length. After 4 h of incubation, the parent bacteria were divided into several daughter bacteria. At 6–10 h, the bacteria were in the exponential growth phase. After 12 h of incubation, the amount of bacteria changed little compared to 10 h, indicating that the bacteria had reached the stationary phase. A positioning observation was performed to obtain a quantitative analysis of the growth of B. coagulans from single cells. Here, droplets were collected in wells of a 96-well plate at a concentration of tens of droplets per well by gentle gradient dilution. Figure 4a presents images of the cells in the microdroplets under a bright-field microscope, acquired every 2 h.
Due to the length of B. coagulans, it was difficult to count the number of bacteria. Instead, the number of effective pixels (pixels occupied by hyphae in the microscope image) was counted to realize a quantitative tracking of the growth of individual B. coagulans in a microdroplet (Additional file 1: Fig. S1). Figure 4b shows the effective pixels (a mean value of 5 droplets) at different time points. It was found that the cells in the droplets experienced an adaptation period (2–4 h), an exponential growth period (4–10 h) and a stationary phase (10–12 h), as observed in the flask (Additional file 1: Fig. S2). 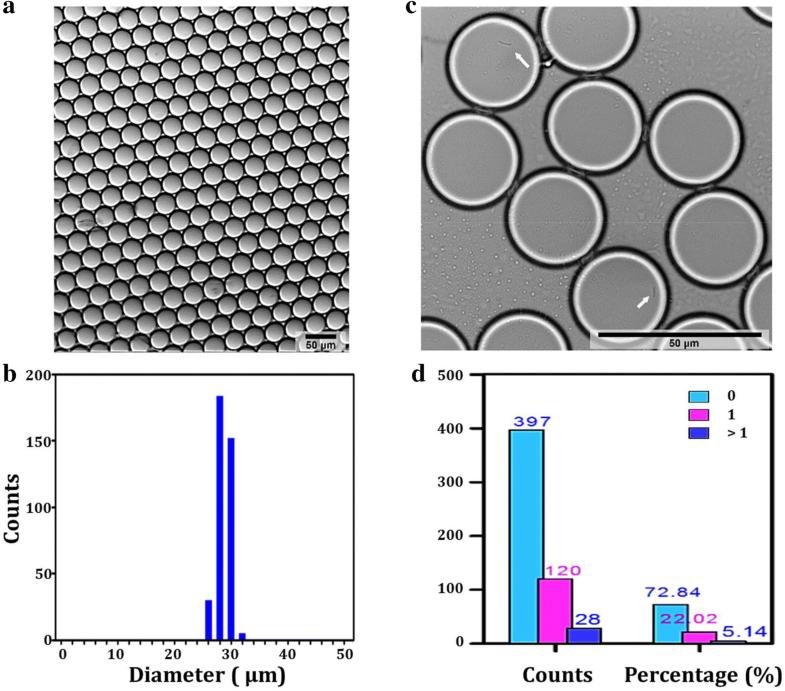 The specific growth rate (μ) of the cells within the droplets was calculated and compared with that in shaking flasks with the same seeding density. The results are shown in Table 1. We found that the specific growth rate of the bacteria in the droplets was similar to that in the flasks. The correlation coefficient for the number of cells in the droplet (characterized by the number of effective pixels) and that in the flasks was determined and was found to reach 0.98 (Fig. 4c). This result indicates that microdroplets can be used as small bioreactors for B. coagulans instead of shaking flasks. Combining the features of small volume (picoliter) and low variability in size (less than 3%), the microdroplets show potential for high-throughput cell culturing and screening for B. coagulans, with valuable characteristics such as high lactic acid yield. In this study, a single colony of B. coagulans that was subcultured for twenty generations in agar slants showed obvious morphological heterogeneity. This type of single colony was incubated in a flask for seed culture and was then encapsulated in the droplets. The cells were consistent in size within the droplets when initially encapsulated. However, microscopic images after 6 h of incubation at 50 °C showed a significant difference in the mycelium length of B. coagulans, as shown in Fig. 5a. The pH fluorescence indicator pHrodo Green (Thermo, USA) was added to the medium before droplet generation to determine whether there is a relationship between the morphological character and the production of lactic acid. The fluorescence intensity of pHrodo increases with decreasing pH. Thus, a higher fluorescence intensity in the droplets represents a higher lactic acid concentration (Additional file 1: Fig. S3). Figure 5b presents a merged image of bright field and fluorescence microscopic images obtained after 6 h of incubation at 50 °C, where the fluorescence is shown in blue. It is obvious that the shorter B. coagulans cells produced more lactic acid than the longer cells. Statistics on hyphal length and fluorescence intensity for one hundred droplets were acquired. In Fig. 5c, the length of the hyphae in one droplet is shown in columns. This value represents the average of five randomly selected hyphae in a given droplet. According to the length of the hyphae, the droplets were divided into three groups: < 5 μm, 5–10 μm and > 10 μm. The fluorescence intensity of the droplets was converted into a gray value for analysis. The square symbols in Fig. 5c present the average gray values of all the droplets in each group. The results indicate that the gray value is negatively correlated with hyphal length. Hence, the shorter B. coagulans cells produced more lactic acid than the longer cells. Due to the advantage of microdroplets in single-cell compartmentalization, the presented experiment visually demonstrated the growth of B. coagulans at the single-cell level. The growth of B. coagulans was quantified by microscopic image analysis. 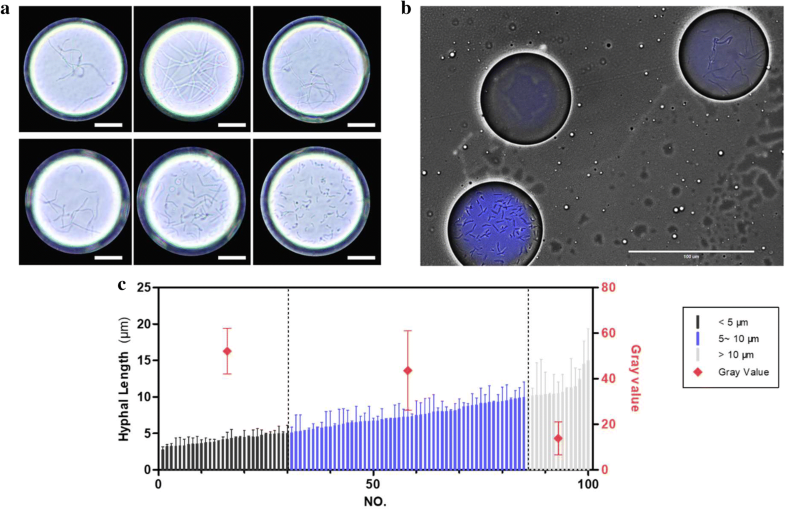 Statistical results showed that the growth status of the bacteria in the microdroplets was consistent with that in flasks, with the correlation coefficient reaching 0.98. This result demonstrates the feasibility of using microdroplets for high-throughput screening for B. coagulans (Maerkl 2009). Moreover, the morphological heterogeneity of B. coagulans derived from a single colony was presented. It was found that shorter B. coagulans cells produced more lactic acid than longer cells. In addition to the biotechnological applications described here, this methodology can be expanded to the culture of other cell lines by altering the environmental parameters. The system also represents a method for studying a range of behavioral and physiological features of bacteria at the single-cell level. XZ and XS designed the experiments. XZ and XS performed the experiments. XZ drafted the manuscript. PZ, YW, JC and BY assisted in the research experiments. All authors read and approved the final manuscript. This work was supported by the National Science Foundation for Young Scientists of China (31700038) and the National Key Research and Development Program (2017YFB0309302). 40643_2018_229_MOESM1_ESM.docx Additional file 1: Fig. S1. The method of pixels counting. (A) Original photo of the droplets. (B) Adjusted image by adjusting the “threshold” and the pixels were automatically counted. Fig. S2. The growth curve of Bacillus coagulans in shake flask without (black) and with pHrodo (red). The data were obtained from three parallel experiments for each. Fig. S3. Lactic acid assay in microdroplets. (A) Fluorescence imaging of microdroplets containing broth with a range of lactic acid, 8 g/L (I), 11 g/L (II), 12 g/L (III), 14 g/L (IV). (B) The corresponding average gray value derive from the fluorescence intensity of the microdroplets in the images of Fig. S1 A.